Announcement Next in-person show will be at the MFA in Boston for their #ArtInBloom show at the end of April. Please visit and wear your best floral celebration ensemble! 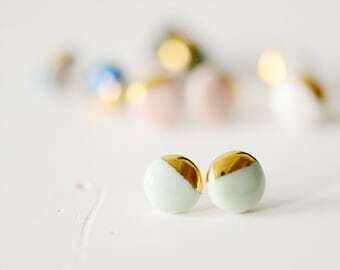 Fine porcelain and stoneware sculpted jewelry for those with sensitive skin allergies. Handmade in Somerville, MA. Working with final metal pairings of 22k Gold, 14k gold, and 14k rolled-gold. Now introducing uniquely coastal brass designs, safe for the wearer and all nickel free. I love designing and making handmade porcelain ceramic sculptures that I high-fire in my little studio kiln! Porcelain ceramic: chosen for its strength and unique translucency as it forms micro-crystals when high-fired. Porcelain has historically been used to create Imperial Chinese vessels in asian pottery for centuries! I am drawn to the history of porcelain as much as I am drawn to the nature of wonderful humans in our desire to wear something special. Since even the cave ages, we have historically found evidence of self-adornment and decoration! Next in-person show will be at the MFA in Boston for their #ArtInBloom show at the end of April. Please visit and wear your best floral celebration ensemble! 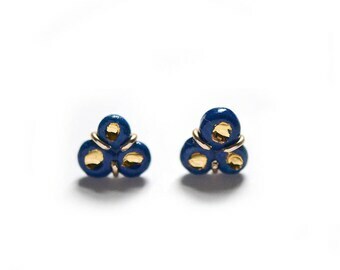 A simply elegant stated pair of studs! Exactly what I was looking for. The color is amazing and it's one of my new favorite things!! Shipping out this marbled porcelain set today! Love making these marbled pieces. Love explaining to folks that I used to carve marble, and porcelain doesnt erode like marble. :) So satisfying! 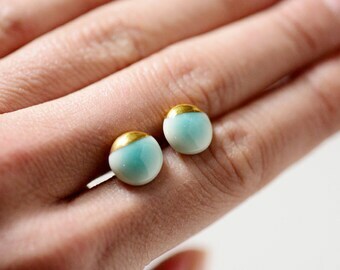 coastal jewelry collection. 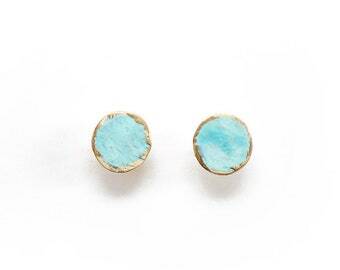 from hammered turquoise patina jewelry to traditional porcelain and 22k gold combinations. I finally took one of my first real vacations from work, and made it a week long break in August of 2012. 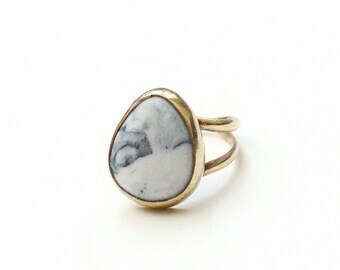 I stayed at home to create a bunch of new porcelain jewelry items that were sitting in my sketchbook. By the end of that week, I had garnered some accidental interest from local shops and friends around my small little wearable sculptures and decided... wait-wait-wait. I can actually DO this! That one week made all the difference, and so, like a crazy-happy-person, I decided to take the big leap, and I quit my day job. A lot of jewelry that I liked, I simply could not wear because I have a serious (-ly disgusting) nickel allergy. I knew I wasn't allergic to white or yellow gold, but at the time, I wasn't willing to spend a lot on a boring and simple design. I love movement and organic shapes, and so that's when I started making my own jewelry! Simply, living and loving life in New England, one step at a time with my husband, our dog, and daily need for running. Loves: organic shapes, nautical bits, rock climbing and grungy textures. Professionally: I have been a 3D animator, building design architect, environmental building consultant, photographer, and graphics designer. About me: I love to create. Family owned, small company that multiple jewelry friends referred me to have my porcelain sculptures cast into metal sculptures. He is the friendliest guy and always so full of energy. I love calling Bill, but hate to bug such a busy person! I have always enjoyed sculpture and designing with my hands. With Porcelain and Stone, I am excited to share the fun side of my craft by making fun sculptural and wearable forms. I love the jewelry side, and am motivated to make them into wearable bits of art. I hope my work brings you a bit of happiness in this great world. Thank you for taking the time to read through some of my shop policies. I hope I am able to provide you with all the information you need, but if you have any questions that I have not addressed, please feel free to send me a message. Returns will be honored if received in the items original condition within 15 days. You will receive the amount you paid back, less the amount of the shipping fee. No returns will be accepted after 15 days. Thank you for respecting our agreement at the time of your purchase! Shipping fees: unfortunately cannot be refunded. I wish I could be more like Zappos/Amazon and just include a little "return to sender" if you ever decided to change your mind. Thank you for visiting and looking around. Happy shopping! I currently accept payment through PayPal. You can also purchase with a credit card if you do not currently have a PayPal account (you may do this through Etsy's website of course)! If payment of an item is not received within two days of an order, the order will be canceled. But, no worries! You will have another chance to try and order the item that will become re-listed in the shop. Massachusetts Residents, yeah you! Because we are blessed to live in such a fine state, you and I are required to pay our dues to exist in our relatively fine country. So, please be aware that you will be charged a state sales tax of 6.25% at check out. Shipping occurs only after payment is received for an item. All orders are shipped within 3-5 business days unless stated otherwise! Your items are also shipped safely and protected to ensure it gets to your destination safely. Please feel free to message me with any question! Thanks for looking, and please check out the other shops I have in my "favorites" for additional hand-crafted items.